This year is starting a new initiative that aims to distinguish the countries where are the most innovative PHP developers. It is the PHP World Championship of the Innovation Award. Read this article or watch the explanatory video to learn all about this initiative and how you and your country can be distinguish for your great PHP contributions. I created the site in 1999 with the goal to spread my own PHP classes. I wanted the users to be able to download my classes and be notified to download again every time I updated the class files. If you have published your own PHP classes somewhere, I am sure you also had the need to get the attention of as many users as possible to give you useful feedback and eventual recognition. After a while I figured that if I opened the site for others to also share their classes there, the site would be useful to many more people, and that would gather the attention of more users to each other classes. This worked great. Over time the site kept growing its interest from PHP developers and nowadays the site has over 1,2 million registered users. Over the years, many contributors have sent their classes. However, some of them were for similar purposes of others that already existed in the site. I lost count of how many MySQL database wrapper classes were submitted to the site. I am sure you also noticed that problem. Some developers were getting upset because they felt the quality of those similar classes sometimes was not that great. Some authors wanted me to not approve those classes. But I though it would not be nice to reject classes from those contributors. They also deserve to have equal exposure. It would break their hearts if I rejected their classes. But I had to do some thing. I thought to myself that it would be better to promote great contributions, than just reject less good contributions. So in 2004 I had this idea to create a contest to promote innovative classes. The idea is to encourage authors to submit classes for new purposes, instead of classes for the same purposes of others already submitted to the site. This idea worked wonders. Every month the site nominates many innovative classes, some of them you do not find in any other sites. So far, over 600 authors submited more than 1000 innovative classes. Everybody wins. The authors win nice prizes from sponsors. The sponsors get practically free exposure for their products. And the quality of the classes in the site has grown a lot. So, the PHP Community as a whole also wins. In the end this award fosters healthy competition. But I thought it could be better if the site users would collaborate somehow to keep bringing even more innovative classes, because some authors are still sending classes for the same purposes of others that exist in the site. So, starting this year, I am launching the PHP Programming Innovation Award World Championship of the Nations. This means that besides the regular competition between individuals, there will also be a competition between countries. It works like this. Now each author accumulates points for each nominated package depending on how it ranked when the users have voted after the month of nomination. There is also a ranking of countries based on the points accumulated by the authors of each country. So the country that acummulates more points until the end of the year will get a special prize. I mean all the nominated authors of that country will get a nice elePHPant mascott, a symbol of PHP associated to the PHP Classes site. Notice that this is not any elePHPant. 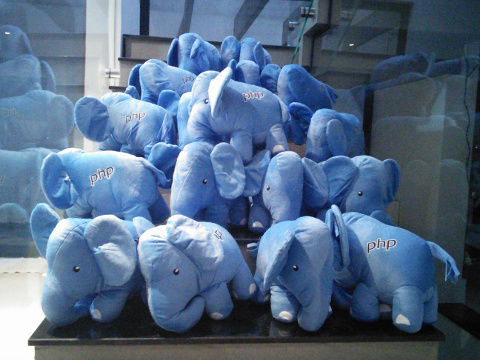 This is of a special production based on the elePHPant that is the logo of PHPClasses. This elePHPant is not available for sale anywhere. Only winners of PHPClasses can get it. Previously only the winner of the year would get this elePHPant. Now, all nominees of the winning country get their own elePHPant. I mean there are loads of cute elePHPants waiting to be sent to your country. You can get started now. You should not only submit innovative classes, but also try to find and encourage other authors in your country that have developed innovative classes, so they also submit them. If your country wins the year innovation award championship of the nations, all of you win. If you do not feel capable of writing innovative classes, that is OK. You can still help your country to win by giving innovative ideas to other authors of your country that are talented. Just go ahead and talk to the talented developers that you know. If you don't have any ideas for innovative classes, here is a special tip. There is a page in the PHP Classes site called PHP Zeitgeist. It shows the top trending topics that PHP developers have searched last year. There you may find plenty of good ideas for innovative packages. So there are plenty of opportunites to win nice prizes. But wait, there's more. I am working on a special prize that you also will get if your country wins. I cannot tell you about it yet because I am still working on it. But I promise it will be awesome. For now, please go and tell about this championship of the nations to your country fellows, so together you can win the nations award! So, that's it! The game is on! Show what your country is capable of! Please help spreading these great news. If you have questions or comments, please post a comment here about this article.